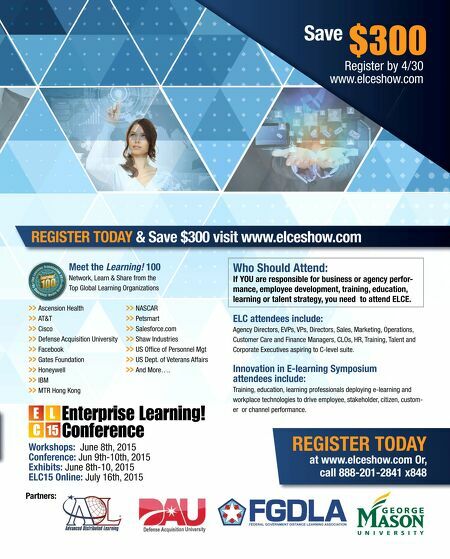 Workshops Sharpen your skills, develop your career, and drive enterprise performance by attending ELC15 workshops. >> CLO Executive Forum: The Business of Learning >> Building The High Performance Organization >> Learning Analytics & Big Data >> E-learning Fundamentals >> Mobile Deployment Strategy >> Play & Design for Game-based Learning >> Cloud-Based Learning >> And more… Keynotes: "Building Learning Environments for the Next Generation" COL Ronald Dodge, CIO & Associate Professor, West Point Military Academy "The Social Web and You, Your Career & Your Organization" Jennifer Golbeck, Author of 'Analyzing the Social Web' & Associate Director Human- Computer Lab, University of Maryland "Growing the High Performance Workforce" Featuring the #1 Learning! 100 Leaders. 50 Sessions: ELC15 in partnership with The Innovations in E-learning Symposium features four distinct conference tracks to help you drive organizational performance. >> Learning Environments for the Next Generation >> Smart Connected Things in Learning >> Learning Analytics & Performance in the Big Data Age >> The Learning! 100 Best Practices Hosted By: June 8-10, 2015 | Manassas, VA Enterprise Learning! Conference is a B2B Media Company, LLC brand. Learn more at www.elceshow.com Co-located with: 3 Keynotes, 10 Workshops and 50 Sessions to Drive Performance REGISTER TODAY & Save $300 Visit www.elceshow.com Or, call 888-201-2841 x848 Where Leaders Meet to W h e r e L e a d e r s M e e t t o Build Smarter Organizations B u i l d S m a r t e r O r g a n i z a t i o via Learning & Workplace Technology.